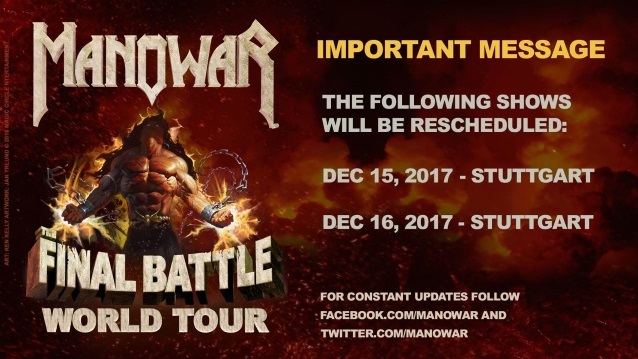 MANOWAR has been forced to cancel its two concerts in Stuttgart, Germany because bassist Joey DeMaio has taken ill.
“Unfortunately, due to food poisoning and dehydration, Joey DeMaio is under doctor’s care and has been ordered not to travel or perform at this time,” MANOWAR said in a statement. “Therefore the last two shows of the ‘Final Battle’ world tour 2017 will be rescheduled. “Joey is expected to make a full recovery and with proper rest and treatment, he will be back to lead the battle once again. The New York-based veteran metal act announced in May 2016 that it would call it quits after one last tour, explaining that its most recent trek — “Gods And Kings” — was a groundbreaking moment in the band’s career and the group aimed to go out on a high. MANOWAR frontman Eric Adams, whose real name is Lou Marullo, spoke about the group’s’s final trek in a recent interview with “Outdoor Adventures With Jayson”. The 63-year-old singer admitted that it was “kind of a Catch-22 thing” knowing that he would never perform with MANOWAR again. “I’m gonna miss the big stage — of course I am — but all good things have to come to an end at some point,” he said. MANOWAR‘s most recent studio effort was 2014’s re-recording of the band’s 1988 album “Kings Of Metal”. DeMaio will embark on “The Blood Of The Kings” spoken-word tour in November 2019.